"I come here several times because the service is very nice." Have a question for Grand Residence Jomtien? "Love this land been here many times all hotels ok some better than others." "Near everything in jomtien, easy to take the truck over to pattaya Beach." "Room was very spacious and staff friendly could of done with..."
Your itinerary won't be complete until you book your stay at the Grand Residence Jomtien. The rooms at this hotel have partial sea and city views for guests to enjoy, so you are bound to be peeking out at appealing scenery. This hotel is near Vicha Eak Cooking School, Thepprasit Road Nightmarket, Jack and Dave, Dongtan Beach, and Pattaya Kart Speedway. It has a bar, allowing you to grab a cocktail in the hotel after a long day out. The Grand Residence Jomtien has various convenient features, such as a selection of shops, a smoking area, safety deposit boxes, and a salon. Featuring a golf course and a spa, it is fully equipped to make your vacation as memorable as can be. Located at an amazing spot for diving, it is great for guests that plan to spend some time exploring all the marine life that this area has to offer. It offers snorkeling, so guests can spend some time exploring the aquatic life in the area. All of the rooms come with towels, a desk, a refrigerator, and a TV, as well as a seating area, a microwave, and a shower. With laundry services, a concierge, luggage storage, as well as daily housekeeping, the Grand Residence Jomtien offers various useful and convenient services to ensure that guests get the most out of their visit. There's free Wi-Fi in all rooms, as well as Wi-Fi in common areas, so guests won't have to spend money on purchasing a local sim card. The front desk is open at all hours, ensuring that there is always someone on call to help you whenever you may need. Pattaya Railway Station is 6.3 km away and Bus Terminal is 6.6 km away. The nearest airports are Utapao International Airport (UTP) and Suvarnabhumi International Airport (BKK), which are situated 27.2 km and 89.2 km away. Check-in is offered from 02:00 PM and check-out is until 02:00 AM. 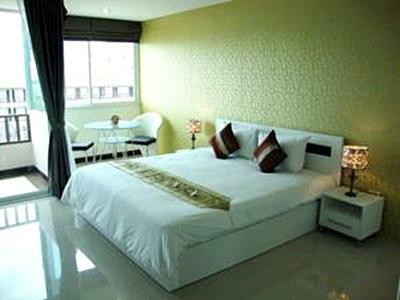 "I stayed for 10 nights good location for Jomtien Beach 5 min..."
Nice spacious room with sea view from 7th floor balcony . Location is perfect for jomtiem. Clean and lovely. On a road which could be an issue if you are a very light sleeper. Glazing is good if you are a good to semi light sleeper. Bedding great. 7-11 down stairs. Food and drinks very close by. Rooms clean and tidy and all the facilities are there with a good size room! Would stay again if price stays competitive! Lack of parking for cars but great location but be prepared for some traffic noise starting early in morning but still great to place to stay! 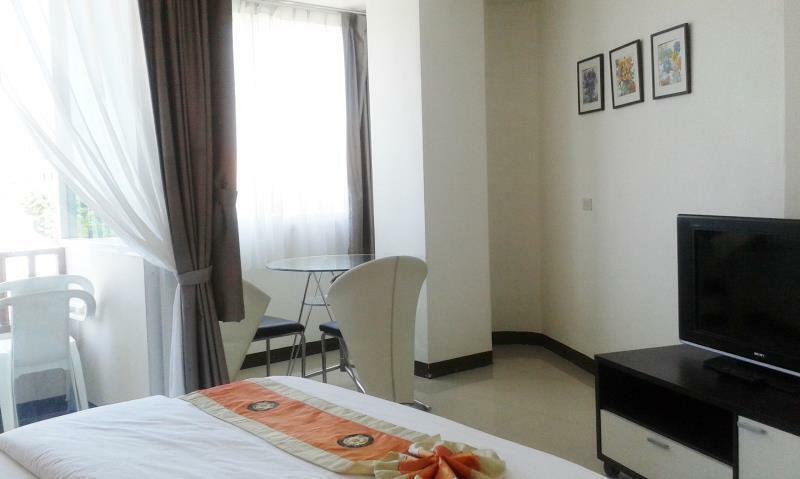 This hotel is ideally located next to rumpo market with food and bars nearby. Also close to jomtien beach. 7 Eleven next door and many good restaurants in the area. The only drawback for me was the parking was not off road and I was worried about pissible damage to my car. If no car tgen no problem. The staff was great and the room very large. An excellent stay. 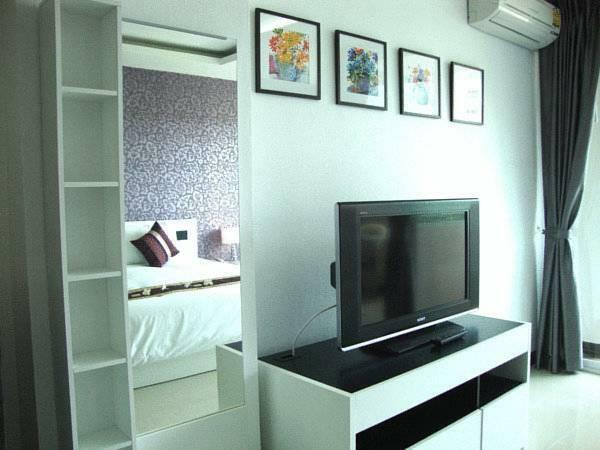 I stayed for 10 nights good location for Jomtien Beach 5 min walk and bars and food walking distance. Room was very spacious and staff friendly could of done with a kettle in room. Taking a TUKTUK to walking street was only 20 Baht and there in 10 mins was very handy otherwise an hours walk. 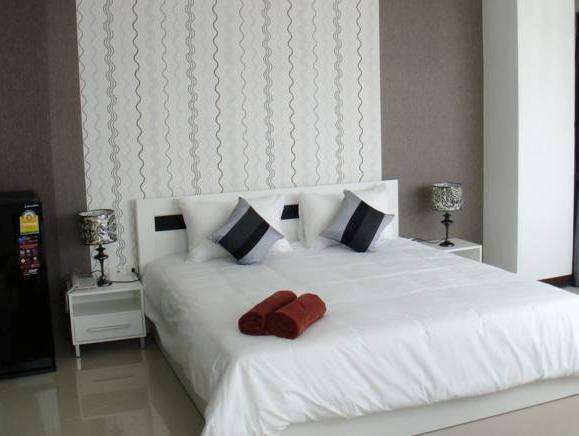 Good value for money, friendly staff , nearby rompo market and 100 eters from beach. Clean and largr rooms. Pros - great location next to rumpo market. 5 min walk to jomtien beach. Big room with microwave. 7 eleven and ATM next door. Kettle would have been handy. Cons - room 304 wifi terrible. Very noisy. Busy road below with traffic and sound proofing not good. Not on baht taxi route but can get from jomtien beach road. Take your ear plugs if you are a light sleeper. My accommodation of choice when i am in Jomtien, a very good location next to the Rhompo market and beer bars, also very good staff at the Grand Residence, Ms Anny is the new lady on the reception and is very kind and most helpful, also the room maids do a very good job keeping the rooms clean, the only issue I would comment on is that sometimes there is some loud noise outside from the traffic on 2nd road and this can be heard inside the rooms, other than that I very happy with the Grand Residence Hotel and will certainly book again for my trip to Jomtien in the next month or so. Couldn't have been happier with the selection of Grand Residence as my accomodation choice and it will be my preferred hotel in future stays in the Pattaya/Jomtien area. Every hotel will have some short comings but after reading previous reviews I felt some were unwarranted in their criticism and I thoroughly enjoyed my Grand Residence experience, both from the standard of the hotel and the friendly/helpful staff. Hope to be back soon. Nice and clean rooms, Room is spacious, staff is helpful but thruout day and night highway road traffic noise was unbearable ......very noisy .... I had sleepless nights and finally decided to move out of the hotel even though i had 4 more days booking. I am surprised read people who says noise didn't bothered them, (how it is possible???). I personally not recommend this hotel anyone nor i will get back here even if free rooms were offered as I had very bad experience in my life. My one and only issue was noise ... it was horrible. I loved this place! After reading all the negative reviews about the noise i was a little apprehensive. If the occasional loud moto or a car passing bothers you then don't go. If you need a clean, comfortable and affordable place then this is a great spot! Sorry, but the road noise did not bother me as the comfortable bed took care of that. If you want cozy beer bars just walk across the street. Also one of the best restaurants in Jomtien across the street as well not to mention the super 7/11 attached. Thanks Grand Residence, I will return! I very much enjoyed my stay at the Grand Residence, very clean and large rooms, great location near to anything you need. All the staff very good. There was one big problem the noise from the traffic we was are the 7th floor but still very noisy, its a shame because the rest of the hotel very good. would recommend double glazing and better fitting windows.